Bu çalışmada, 1985-1999 yılları arasında Trakya Bölgesi’ndeki farklı lokalitelerden toplanan tatlısu Oligochaeta örnekleri taksonomik olarak değerlendirildi. Toplamda 11 Oligochaeta türü belirlendi. Ayrıca, Trakya Bölgesi’nde şimdiye dek sucul ve yarı sucul Oligochaeta faunasına ait yayınlanmış taksonomik çalışmalar da bu makalede tartışıldı. Sonuç olarak, Trakya Böl-gesi’nde Oligochaeta’ya ait toplam 37 türün bulunduğu özetlendi. Naididae familyası 27 türle en çok karşılaşılan familya olarak belirlenirken bunu, 7 türle Enchytraeidae familyası izledi. Haplotaxidae, Lumbricidae ve Propappidae familyaları ise Trakya Bölgesinde sadece birer türle temsil edildi. Freshwater oligochaetes have long been rec-ognized as common and permanent inhabitants of diverse aquatic habitats including lotic and lentic systems, surface waters, groundwater, and coarse as well as fine sediments (Brinkhurst and Ja-mieson, 1971). Oligochaeta species are a very significant part of the zoobenthos in inland water bodies. Oligo-chaetes are good indicators of environmental variation because of easy samples collections and taxa identification, and their relatively long life cycle, limited migration ability, and different sensitivity to different environment (Barbour et al., 1999, Liu et al., 2004). Faunistic and ecologi-cal knowledge of oligochaetes in the Thrace Re-gion of Turkey is still insufficient. There are a few studies about the taxonomy and distribution of Oligochaeta species of Turkish Thrace (Çamur-Elipek, 2003; Kırgız et al., 2005; Çamur-Elipek et al., 2006). The Thrace region which has 24.378 km2 area is located in the north-west part of Turkey. There is a lot of water resources likewise rivers, streams, lakes, ponds etc. in the region. Never-theless, a lot of agricultural activities, industriali-sation, and urbanisation cause many environ-mental problems and degradation in the region. Presently, freshwater resources have been under effects of intensive pollutions in Turkish Thrace. In this study, it was aimed to determine the aquatic and semi-aquatic oligochaeta fauna of Turkish Thrace. For this aim, the oligochaeta specimens were collected from different localities in Thrace Region of Turkey between 1985 and 1999 years and they were identified to the possi-ble lowest taxonomic level. Also, the taxonomi-cal data has been gathered on aquatic and semi-aquatic oligochaeta fauna from limnological studies which were performed in Thrace Region of Turkey up to now. Turkish Thrace is located between latitude 41° 06' N and longitude 27° 29' E localities of Tur-key. The region lies on south of Bulgaria, and on north-east of Greece. Thrace Region which is also known as European part of Turkey is sepa-rated from Anatolia by the Marmara Sea. Fur-thermore, it is surrounded by the Black Sea at its north-east and the Aegean Sea at its south. The material was collected by using Ekman Birge Grab (15x15 cm) and hand grabs between the years 1985 and 1999 from a total of 19 different localities in Turkish Thrace region (Figure 1). Figure 1. The study area and the sampling localities. The Oligochaeta samples were identified to the possible lowest taxonomic level under ste-reobinocular microscope by using the literatures of Brinkhurst (1971, 1978), Brinkhurst and Ja-mieson (1971), Brinkhurst and Wetzel (1984), Kathman and Brinkhurst (1998), Milligan (1997), Sperber (1948, 1950), Timm (1999), Wetzel et al. (2000). A total of 11 Oligochaeta species were deter-mined from Turkish Thrace between the years 1985 and 1999 at 19 different localities. Further-more, a total of 9 oligochaeta taxa have been re-ported from Terkos Lake and a total of 31 aquatic or semi-aquatic oligochaeta taxa have been re-ported from Tunca River (Çamur-Elipek, 2003; Kırgız et al., 2005; Çamur-Elipek et al., 2006) (Table 1). Consequently, it can be reported that a total of 37 aquatic or semi-aquatic oligochaeta taxa from 28 different localities in Turkish Thrace. It was observed that the family Naididae was the most came across group with 27 species in Turkish Thrace. The subfamily Tubificinae was the most diverse group with 16 species and it was followed by the other members of the family Naididae with 11 species. While Enchytraeidae family was represented with 7 species, the fami-lies Propappidae, Haplotaxidae, and Lumbricidae were represented with only one species. Turkish Thrace region is a rich area for lotic and lentic habitats, apart from being of im-portance with regards to zoogeography, ecology and geology. It also spans both the fauna of Eu-rope and Asia. Therefore, biological richness of inland waters in Turkey has attracted attentions of researchers, and all these previous studies made in Turkey concerning oligochaetes are available. According to the previous studies and the pre-sent study, Oligochaeta has been represented by a total of 37 species in Turkish Thrace region. Both collected data and present study results show that Oligochaeta fauna of Thrace region is composed of cosmopolitan or widely distributed species while Haplotaxidae and Lumbricidae have small numbers of species (Table 1). According to liter-ature data, the most recorded genera are Pristi-nella, Nais accompanied by Psammoryctides, Potamothrix, Tubifex and Limnodrilus. Irrigation, pesticides and uncontrollable an-thropogenic deposits affect freshwater sources negatively. A lot of factors such as pollution from agricultural areas and settlements, destruction of the aquatic plants around the water resources, and excessive hunting cause habitat destruction with decline levels of aquatic biodiversity at freshwa-ter resources. In the last decade, agricultural ac-tivities, industrialisation, and urbanisation have increased at Turkish Thrace. Therefore, they cause many environmental problems in the re-gion, especially in the water resources. A lot of freshwater resources have been under effects of intensive pollutions in Turkish Thrace (Kırgız and Guher, 1992; Aydınlıyım, 1997; Özkan and Kubaş, 2008; Taş et al., 2008). Macrobenthic fauna in an aquatic ecosystem can answer the pollution by increasing or de-creasing of their number, or by their extinction from the system. Oligochaeta is the one of useful group within the macrobenthic fauna to watching the pollution by use the aquatic organisms (Wet-zel et al., 2000; Taş et al., 2008). This group has a lot of indicator species to show the pollution in the water resources (Brinkhurst and Jamieson, 1971; Timm, 1970 and 1999; Wetzel et al., 2000). Most naidid species occuring throughout the world are also cosmopolitan (Wetzel et al., 2000) and they have clearly adapted to a wide range of environmental conditions (Brinkhurst and Ja-mieson, 1971). The subfamily Tubificinae and several of its genera (e.g. Tubifex and Limnodri-lus) are considered cosmopolitan specimens (Wetzel et al., 2000). Limnodrilus hoffmeisteri, a cosmopolitan, is perhaps the most commonly collected freshwater oligochaete throughout the world. It occurs in a wide variety of surface water habitats, reaching very high abundance in organi-cally enriched areas often with records of Tubifex tubifex and of Limnodrilus udekemianus (Brink-hurst, 1975), which is also supported by this study. The Enchytraeidae is a cosmopolitan family which contains semi-aquatic species and have found from the littoral region of aquatic habitats (Wetzel et al., 2000; Kırgız et al., 2005). Most species are terrestrial but a few are found com-monly in freshwater and they have large number at littoral zone or marine (Nielsen and Christen-sen, 1959). However, in this study, the specimens belonging this family were collected from littoral region of the aquatic habitats of Turkish Thrace (Table 1). As a result of this study, it was shown that valuable aquatic resources and the living things within these habitats are becoming increasingly susceptible to both natural and environmental changes. Thus, conservation strategies to protect aquatic life are necessary to maintain the balance of nature and support the availability of resources for future generations. It was suggested to perform the detailed stud-ies on Oligochaeta fauna of Turkish Thrace as soon as possible because the water resources are under deterioration threat. This may cause ex-tinction of the benthic fauna in the water re-sources. Aydinliyim, F., (1997). Ergene Nehri Kirlilik Arastirmasi. TMMOB Çevre Mühendisleri Odasi, 2. Ulusal Çevre Mühendisligi Kon-gresi, 4-5 Aralik, Istanbul. Barbour, M.T., Gerritsen, J., Snyder, B.D., Stribling, J.B., (1999). Rapid bioassessment protocols for use in streams and rivers: pe-riphyton, benthic macroinvertebrates, and fish. Second edition. EPA 841-B-99-002. U.S. Environmental Protection Agency, Of-fice of Water, Washington, D.C.
Brinkhurst, R.O., (1971). A Guide for the Identi-fication of British Aquatic Oligochaeta. Freshwater Biological Association, Scien-tific Publication No.22, 2nd edition, Toronto 53 pp. Brinkhurst, R.O., (1975). Oligochaeta, in:F.K.Parrish (Ed. ), Keys to the Water Quality Indicative Organisms of the South-eastern United States. Cincinnati, OH, U.S.Environmental Protection Agency, Of-fice of Research and Development, Envi-ronmental Monitoring and Support Labora-tory, USA:69-85. Brinkhurst, R.O., (1978). Limnofauna Europaea, IIIies J., Gustav Fisher Verlag, Stutgart, pp: 139-147. Brinkhurst, R.O., Jamieson, B.G.M., (1971). Aquatic Oligochaeta of the World, Oliver and Boyd, Edinburg. Brinkhurst, R.O., Wetzel, M., (1984). Aquatic Oligochaeta of the World: Supplement a Catalogue of New Freshwater Species, De-scriptions and Revisions No:44, Canadian Technical Report of Hydrography and Ocean Science, Canada, 101 pp. Çamur-Elipek, B., (2003). The dynamics of Benthic Macroinvertabrates in a Meso-trophic Lake: Terkos, Turkey, Acta Biolog-ica Iugoslavica - Serija D: Ekologija, 38 (1-2): 31-40. Kathman, R.D., Brinkhurst, R.O., (1998). Guide to the Freshwater Oligochaetes of North America, Aquatic Resources Center, Ten-nessee, USA, 264 pp. Kirgiz, T., Güher, H., (1992). Trakya Bölgesi’nde Sazlidere ve Çorlu Derelerinin Bentik Fau-nasi Üzerine Kirliligin Etkileri. II. Uluslararasi Ekoloji ve Çevre Sorunlari Sempozyumu, 5-7 Kasim, Ankara, 83-92. Kirgiz, T., Çamur-Elipek, B., Arslan, N. (2005). Preliminary study of Enchytraeidae (Oligo-chaeta) in the Tunca River (Thrace, Turkey), Proceedings of the Estonian Academy of Sciences Biology Ecology, 54 (4): 310-314. Liu, Y., Vermaat, J.E., Ruyter, E.D. De Kruji, H.A.M., (2004). Modification and applica-tion of biomonitoring ISO BMWP method of macrofauna in river pollution evalution in China, Acta Scientiarum Naturalium Uni-versitatis Sunyatseni, 43 (4): 102-105. Milligian, R.M., (1997). Identification Manual for The Aquatic Oligochaeta of Florida Vol-ume I ,Freshwater Oligochaetes. State of Florida Department of Environmental Pro-tection Tallahassee, Florida. 187 pp. Nielsen, C.O., Christensen, B., (1959). The En-chytraeidae, a critical revision and taxonomy of the European species, Natura Jutlandica, 8-9:1-160. Özkan, E., Kubas, A., (2008). Ergene Havzasin-daki Kirliligin Sosyo Ekonomik Etkileri., Havza Kirliligi Konferansi (5. Dünya Su Fo-rumu Bölgesel Hazirlik Süreci Türkiye Bölgesel Su Toplantilari), 26-27 Haziran, Izmir. Sperber, C., (1948). 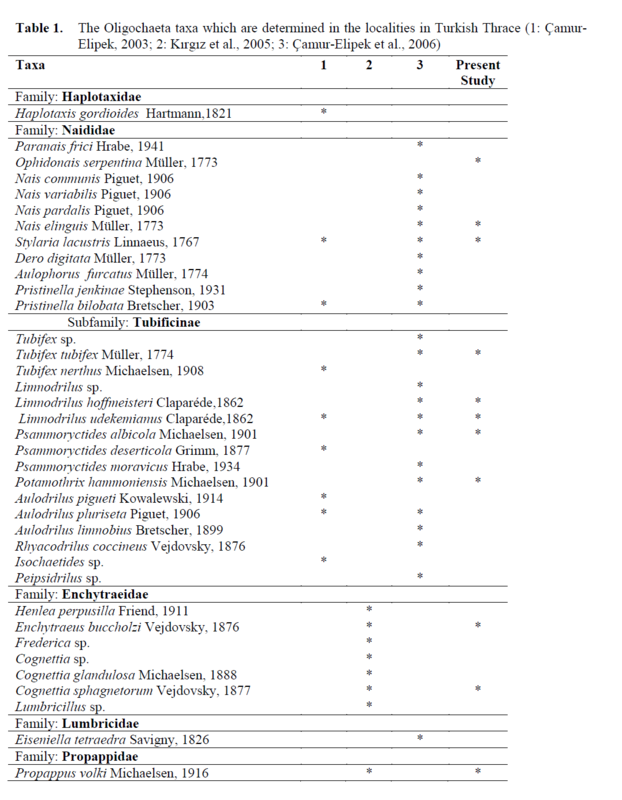 A Taxonomical Study of the Naididae, Zoology, Bidrag, Uppsala,28: 1-296. Sperber, C., (1950). A Guide for the Determina-tion European Naididae, Zoology Bidrag Uppsala, 29 : 45-78. Tas, M., Kirgiz, T., Arslan, N., Çamur-Elipek, B., Güher, H., (2008). Çorlu Deresi’nin (Tekirdag) Oligochaeta Faunasi ve Bazi Fizikokimyasal Özelliklerinin Zamana Bagli Degisimi, Ege Üniversitesi Su Ürünleri Dergisi, 25 (4): 253-257. Timm, T., (1970). On the Fauna of Estonian Oli-gochaeta, Pedobiologia, 10 : 52-78. Timm, T., (1999). A Guide to the Estonian An-nelida. Naturnalist’s Handbooks 1, Tart-Tallin, 208 pp. Wetzel, M.J., Kathman, R.D., Fend, S.V., Coates, K.A., (2000). Taxonomy, Systematics and Ecology of Freshwater Oligochaeta. Work-book Prepared for North American Bentho-logical Society Technical Workshop, 48th Annual Meeting, Keystone Resort, CO. 120 pp.